We are delighted to announce that registration for the annual Get Going Get Rowing Splash ‘n’ Dash Blitz, proudly supported by Dublin City Sport and Wellbeing and Dublin City Council, and Waterways Ireland, in Grand Canal Dock is now open to female only crews in schools involved in the Get Going Get Rowing programme. The event will take place in Grand Canal Dock on Thursday May 9, 2019 from 10am to 2pm. Registration will take place in the Waterways Ireland office and will be open from 9:15am. 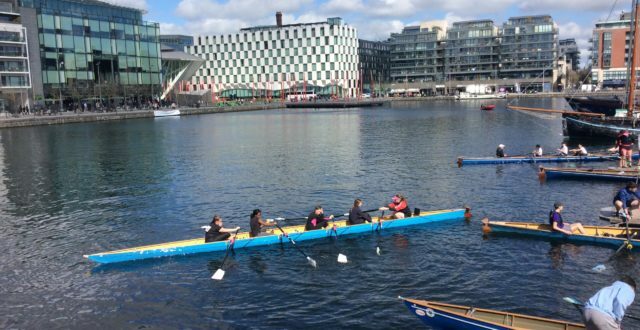 The event is an on the water racing blitz in training boats (coxed by an experienced coach) with the crews racing over 250m – crews are made up of 4 girls and entry is €3 per entrant- payable on the day or by invoice in advance of the event. If you have any queries, please contact mary.moloney@rowingireland.ie. We look forward to seeing you there!